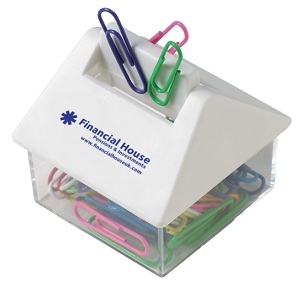 House Shape Clip Dispenser - Express Corporate - Promotional Products - Delivered Fast! A useful product for storing paper clips neatly. Good sized branding area for your logo. Price includes a pack of paper clips. Quantity Discounts Save up to 40% when ordering higher quantities of this item. Please call 0845 500 4420 for details.